Google released new feature for Gmail that allows users to preview attachments like photos, videos, documents and PDFs within Gmail. If you want see those previews in fullscreen mode, just click on those preview. In fullscreen mode you can view and read attachments right in Gmail. And also with new Gmail users can save the attachments directly to their Google Drive account without ever leaving Gmail. To save your Gmail attachments directly to Drive simply click on a new Drive icon which will appear by hovering your mouse cursor on a preview. 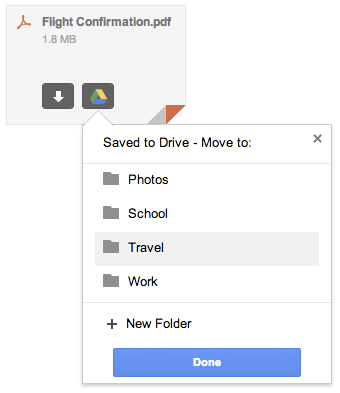 By saving your attachment file to Google drive you can open it anywhere at anytime with any device computer, phone or tablet. According to Google's official blog post the new attachment feature for desktop users will be rolling out over the next weeks.